Newly engaged and feeling a bit overwhelmed when it comes to the whole registry thing? Well, rest assured, friends. Because I've been there and done that. And guess what? I've teamed up with my friends over at Macy's to bring you a series that includes some of my personal recommendations and registry must-haves! Now, these recommendations will be items that were on our actual registry or they're things I wish we would have included. So without further ado, here's the first of my registry must-haves! One mistake I often see couples make is when they forget to register for everyday, casual dinnerware! It's totally natural to want to register for the fine china. But what about the stuff you're going to use everyday? And so today I'm excited to share with you this casual and colorful (you know I love that!) set from Macy's! The DKNY Lenox Urban Essentials White Collection makes setting the table in style a snap. With it's bright and beautiful bands of color and it's modern design, these darling dishes sure do make my everyday dishes look a little boring. And did I mention how easy it is to mix and match with all of the other pieces in the collection? Seriously, where was this set back when we were registering? Crafted in sleek porcelain with invigorating shapes, the Urban Essentials Collection from DKNY by Lenox is chic and sophisticated. And lucky for you, you can easily add this set to your Macy's Registry! Don't have a registry with Macy's yet? No worries. Registering is easy! Simply follow this link and you're good to go! 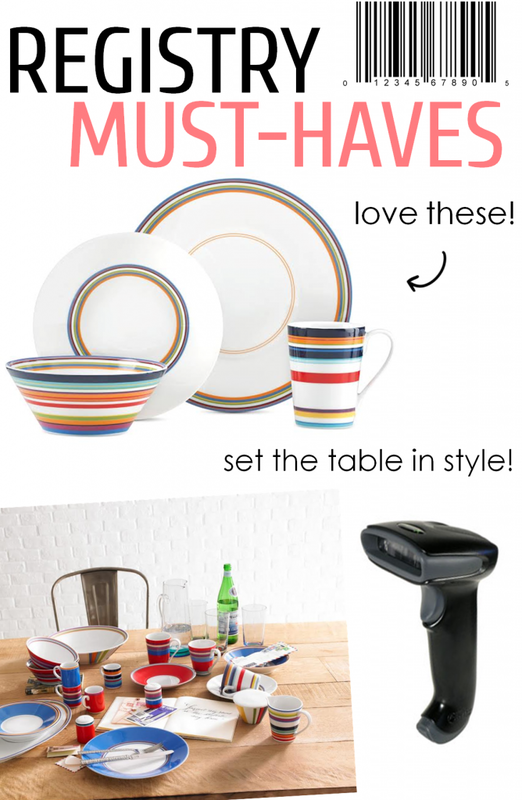 5 Comments " Macy's | Registry Must-Haves "
That set is super cute!